TurnKey Art Solutions offers a specialty art product that literally ties photos of Houston's Yesterday with photos of Today in one quality, custom piece of art designed to your specifications. This, with our collection of old maps and vintage Houston photos, can add a special touch to any home or office. 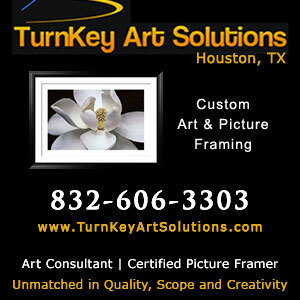 For Home, Office, or BtoB, TurnKey Art Solutions offers superior quality custom art framing. Our service area now includes the entire continental U. S.
At TurnKey Art Solutions, we provide art and wall décor solutions for companies in the Greater Houston area, as well as anywhere within the continental United States. Companies spend thousands, if not millions of dollars, for marketing and advertising campaigns to promote their company's image and products. Yet the office artwork, if there is any at all, says absolutely nothing about the company. Worse yet, it may say the wrong things. Beautiful artwork decorating the walls in your office can make a definitive statement of a company's core values and success. We work with you and your staff to create the complete art and decorating solution for your company that will turn your walls into "Works of Art". In addition to our Free On-Site Consultation, TurnKey Art Solutions is available by appointment at our Cypress or Galleria/Katy Freeway area locations. Come shop for original art, prints, and custom framing. Those who view Thomas Ward's images are captivated as much by what they feel as by the stunning visual revelations of his floral art. Art Glass Glass etching, glass carving, and specialty window treatments have the ability to be functional as well as beautiful. They express your company's quality and commitment to excellence. Please call 832-606-3303 or 281-955-5400.